December 5th, 2016 – last Friday Intus Windows sponsored the Terrance West Celebrity Bowling event outside of Baltimore, MD. Terrance West is a professional football player for the Baltimore Ravens. Terrance was joined by other Ravens players such as Eric Weddle, Lardarius Webb, Devin Hester, Zachary Orr and Anthony Levine. The event helped fund a United Way campaign to provide toys for Baltimore area families in need. The event raised over $10,000. Intus was one of 30 companies sponsoring the event. Other participants include Fillat + Architecture, Ayres Saint Gross Architects, Custom Glass Services. We are looking forward to more events in the future to contribute to the good cause. With a New York City Council vote on July 14, 2016 NYC adopted amendments to the new New York State (NYS) energy code, which go live October 3rd of this year. Since any amendments to the state code must technically be of greater stringency, there are some notable additions. In this article we will discuss the highlights of both the new NYS and NYC energy code versions for commercial construction (includes multifamily above 3-stories) and what to expect in upcoming revisions as the bar is raised on energy efficiency and high performance buildings. Before we discuss the highlights, here is a quick primer on the underlying basis of the new code. The new NYS energy code also known as New York State Energy Conservation Construction Code (NYSECCC) is based on a model code and standard – 2015 International Energy Conservation Code (IECC) and ASHRAE 90.1-2013. Naturally, the NYSECC is then referred to as 2015 IECC + 2016 NYS Supplement. In NYC, it’s simply 2016 NYCECC. Got it? Above deck roof insulation increased to R-30 continuous on masonry buildings. Specific to NYC, mechanical louvers, such as the exterior side of a PTAC, must now be accounted for in meeting opaque envelope requirements. SWA’s simulations of this change concluded that steel-framed buildings would need to add a modest amount of continuous insulation to account for this. With a renewed focus on thermal bridging, SWA predicts an accounting of all thermal bridges including shelf angles, clips, and masonry ties may be next. See references below. Buildings between 25,000 and 50,000 square feet must conduct blower door testing. Buildings over 50,000 square feet must test or inspect each type of air barrier joint and seam. Stay tuned for more on this in a follow-up series of articles. by Ryan Merkin, Steven Winters Associates, INC.
From left, Ben Walter, principal and lead architect at CWS Architects; Erin Cooperrider, principal and lead architect at Community Housing of Maine; Cordelia Pitman, director of pre-construction services at Wright Ryan; and D’arcy Main-Boyington, economic development director for Brewer. 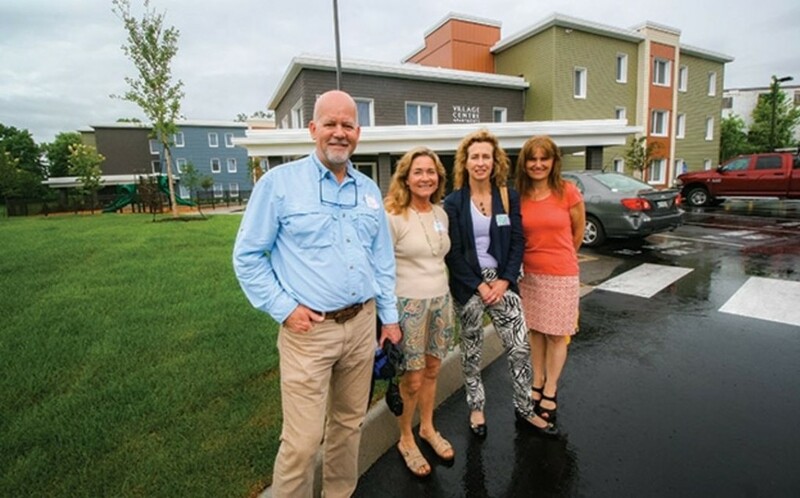 The concept behind the super-insulated passive house got a big boost with the construction and recent opening of Village Centre in Brewer, a 48-unit housing aimed at working families and individuals with qualifying incomes. The trick with this project was that the site, design and budget were already nailed down when the developer decided to pursue passive house standards for a highly insulated, airtight structure that can be heated in the winter and cooled in the summer with minimal energy consumption. The site is at 266 Center St.
And the success of this project, with only a 3% overage in the budget, demonstrates the passive house is doable and affordable for anyone, says Portland-based CWS Architects Principal Ben Walter, the project’s lead architect. 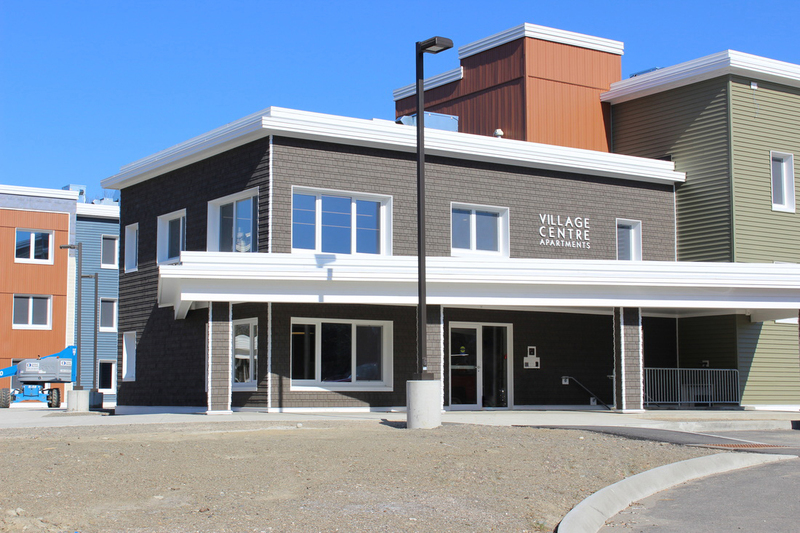 Village Centre’s attractive exterior design features variegated facade projections, heights, hues and window placements. The 54,886-square-foot building is made up of one- to three-bedroom apartments. A grid-connected photovoltaic array with 100 solar panels, purchased from ReVision Energy, is mounted on the roof to generate 26 kilowatts. Construction cost just under $8 million. The site was a former middle school torn down as part of school consolidation. In its place, the city decided on affordable apartments in partnership with Portland-based Community Housing of Maine, a nonprofit that develops, owns and maintains affordable housing. CHOM obtained a competitive Low Income Housing Tax Credit allocation from the Maine State Housing Authority, along with construction financing from TD Bank. The solar array was paid for with a grant from the TD Charitable Foundation, the charitable giving arm of TD Bank. Goals included revitalizing the neighborhood and creating community connectivity with green-space walkways, public parking and public transit links. The project enjoys proximity to shopping, schools and entertainment. Amenities include an on-site laundry, indoor play area, library, community kitchen, bike storage, playground, community garden, covered bus shelter, resident service coordination and 24-hour emergency maintenance. Passive house standards are increasingly well-known in Maine as a highly insulated structure with airtight envelopes, energy-recovery ventilation, high-performance windows and solar gain. Village Centre — now one of the largest passive house developments in North America — had to stay within cost limits imposed by the LIHTC financing program. With Walter on the job, CHOM — which bought the property for $5,000 and was the project’s developer — went into the project with LEED certification in mind. Leadership in Energy and Environmental Design is a third-party certification program for high-performance green buildings, focused on material sustainability and environmental quality. CHOM has completed other LEED projects in recent years. “We have forward-thinking board members who said, ‘Let’s think about a passive house structure,’” says CHOM Development Director Erin Cooperrider. The group had a site, building design, budget and permits. Wright-Ryan Construction in Portland was the general contractor. The challenge, Cooperrider says, was achieving passive house standards without changing the building’s footprint or exceeding a cost limit of $145 per square foot. With energy-modeling help from Thornton Tomasetti, an engineering firm with offices in Portland, Walter and Wright-Ryan designed, priced and modeled multiple variations of wall type, insulation packages, envelope air-sealing and mechanical systems. The first passive house in the United States was built in 2003 by German architect Katrin Klingenberg, in Urbana, Ill., according to the nonprofit Passive House Institute US, which was founded by Klingenberg. PHIUS is today known as the leading passive building standards provider in North America. According to the PHIUS website, standards are based on climate-specific comfort and performance criteria, with the aim of finding “the sweet spot between investment and payback to present an affordable solution to achieving the most comfortable and cost-effective building possible and the best path for achieving zero energy and carbon.” Buildings designed and built to this standard perform 60% to 85% better than conventional construction, PHIUS says. Village Centre is conventionally wood-framed with double-stud walls incorporating a foot of cellulose insulation. It’s protected by an air-seal membrane and tube sealant that was meticulously applied to every penetration. The process is not rocket science, says Cordelia Pitman, director of pre-construction services at Wright-Ryan. What’s essential is to make sure all sub-contractors — in this case, all 21 of them — understand the importance of the seal. Super-insulated, triple-glazed windows provide further climate control and also dampen noise. Changes to the building to achieve PHIUS+ certification resulted in a 3% bump in construction costs. But the result is expected to be a steady comfortable temperature inside — warm in the winter, cool in the summer — with no central heating system and with only occasional use of the supplemental electric baseboard system. And that’s “the hidden story,” says ReVision engineer Hans Albee. What’s great about the PHIUS+ standard, says Cooperrider, is it encourages the tinkering seen throughout the Village Centre process. Are the principles used in Village Centre translatable, from a cost-perspective, to a market-based commercial project? Data collection from Village Centre is expected to back up claims about savings and paybacks that could improve financing options for future passive house projects. Cooperrider says CHOM will continue to deploy the passive house concept. What makes this church a truly unique Passive House project is the large wall covered completely in fixed glass. This allows for an extravagant view of New York’s countryside and plenty of natural lighting. This is where the contribution of Intus Windows is truly apparent. Jordan Dentz, the certified Passive House Consultant, worked with building designers and the Intus team to figure out how the glass could handle strong winds and the structural load. Using closed-cell polyurethane foam and blown fiberglass insulation the team figured out how to seal and insulate the whole building while being structurally complete. The rest of the windows around the building are our triple-pane high performance windows. Even if room temperature is at an adequate level any contact with the surface of glass with a temperature less than 52 degrees Fahrenheit can cause occupant discomfort. This is because more heat is aggressively radiated from a person’s body to the cold surface of the glass. High performing windows with low U-values always stays within the comfortable range of surface temperate during the winter, thus removing this problem. At the same time this removal of cold surface glass temperate insures that there will be no thermal drafts from the sinking of cool air when encountering the warm air in a house’s envelope. During the winter months occupants will not have to worry about accidentally exposing themselves to the icy touch of freezing glass temperatures, and at the same time will be able to relax next to a window without worrying about cold drafts of air.